Everything was fine until I saw Casper (used interchangeably with Casimir) and Francis Smielewski being shown as father and mother. It certainly seemed very strange that a “Smielewski” should be the parent of a “Ciechanowski”. I had never previously heard of the name Smielewski, and thus was quite confused. Here was a major question that required extensive detective work to sort out the details. Gr-grandfather Ambrose (Ambrozy) Ciechanowski, was born Sliwice, powiat Tuchola, in the province of Bydgoszcz, Poland. The small church town of Sliwice, German name Groß Schliewitz, is located on the river Sliwiczka and is 25 km. northeast of Tuchola and 80 km south-southwest of Gdansk. Map Showing Location of Sliwice (Groß Schliewitz), Powiat Tuchola, in the Province of Bydgoszcz, Poland and its Proximity to Gdansk. Smielewski Family DataAmbrose was one of five children born to Thomas (Tomasz) Ciechanowski (?-?) and Francisca Dobecka (1799-1894). The only death date I have is for Thomas Smielewski, who died May 25, 1909 in Paris Twp, Huron Co, MI. Copulatorum Records Title Page for the Village of Sliwice, 1842. Marriage Record of Casimir Smielewski and Francisca Dobecka-Ciechanowski, Dated 4 May 1842, in Sliwice, Poland. 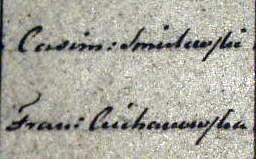 Close-up of Names Smielewski and Ciechanowski. So, this matrimonial union provided motherly support for the Smielewski children and both fatherly and financial support for the Ciechanowski children. This entry was posted on Monday, March 26th, 2018 at 12:41 pm and is filed under Charles Chase. You can follow any responses to this entry through the RSS 2.0 feed. You can leave a response, or trackback from your own site.